Sales operations leaders play a crucial role in translating firm objectives into actionable sales force plans and programs and ultimately achieving sales growth. In fact, recent research from the Sales Management Association shows that sales operations’ responsibilities are expanding, and that sales operations departments face increasing pressure to deliver both strategic and tactical assignments. With this expanding responsibility comes a need to identify the best ways to reconcile competing responsibilities while improving sales productivity. Join us to learn from our panel of top Sales Operations Executives who have faced, are facing, and are solving some of the thorniest challenges you'll face in 2016. If anyone can speak to the complexities of incentivizing people all over the world, it’s Telstra. With seven different business units, 20 countries, and 9,000 payees, Telstra uses CallidusCloud Commissions to drive behaviors around the world and among all roles, from technicians to call center sales reps.
- Explore the ways CallidusCloud helped Telstra increase visibility, reduce risk, and improve payment accuracy. - Get suggestions for ways to start your search for a commissions tool. - Understand how Telstra is now able to get more insight and solid reporting from its data. - Learn how Telstra's implementation relates to the opening crawl of Star Wars. Andrew White is currently the Head of Sales and Service Incentives for Australia's largest telecommunications and media company, Telstra. He has over 20 years’ experience in various human capital roles. During this time, Andrew was a Reward Practice Manager for CSI/Hewitt/Aon, looking after a broad range of clients across most compensation and benefits areas including benchmarking, job grading, reward strategy, executive compensation, R&R and benefits. This has included most industry sectors but in particular, high-tech, telco, financial services, and NFP. Ben Gray is currently the Program Manager of Incentives Systems for Australia's largest telecommunications and media company, Telstra. He joined the team in 2015 to help manage completion of the 3-year implementation of Sales Incentives Plans into the CallidusCloud suite for seven major business units that pay incentives. He has over 17 years’ experience in the information communications technology Industry. During this time, Ben has managed operational teams and centers performing resource management, planning and work deployment for Telstra’s national workforce of communication technicians. Please join CallidusCloud on Tuesday, December 5, 2017 at 2:00 PM (EST), for a 60-minute webinar co-hosted by EITF Member Tony Sondhi. Tony Sondhi is an author, instructor, and one of the preeminent experts in the fields of revenue recognition and financial reporting risks. He and David Williams, Sr. Revenue Manager for CallidusCloud, will discuss backlog disclosure requirements and critical issues you need to consider to successfully implement the new revenue standard ASC 606. ASC 606 requires substantive new disclosures about performance obligations. Companies must disclose qualitative and quantitative information about the amount of the transaction price allocated to the remaining performance obligations, including when those remaining amounts will be recognized as revenue. * Implementation challenges, system needs and key implications of the issues raised in ASC 606. Are you truly making a positive difference in your workday, every day? Sales operations teams know very well what they do, but struggle to explain it to others. The best way to be effective as a sales operations team is to proactively identify the upcoming challenges in sales and put the fires out before they surface. You need to have access to critical insights. Easy enough-right? Not really, there is always a challenge in balancing the resources between short-term tactical demand and longer term strategic initiatives. After many acquisitions, Total Safety needed to standardize and consolidate processes and their business offerings. Melissa Bennett led the transformation of Total Safety’s sales processes focusing on the alignment of sales technology, process and sales leadership. Hear how she selected the tools, which tools she wanted to work together, what preparations were made before implementing CPQ, how she kept the implementation on-track, how she managed sales team expectations and adoption, and the remarkable business benefits she delivered. Anyone contemplating a CPQ project or an enterprise transformation project can gain valuable insights from a person who has “been there, and done that”. Bill Butler, Director of Solutions Marketing, CallidusCloud is a veteran technology sales and marketing leader. He has focused on creating value with highly technical products including embedded computing hardware, BIOS software, IoT, inertial navigation sensors, algorithm IP and enterprise SaaS software. Born in Canada, he’s lived and worked in South Korea as well as the NY, Chicago and now San Francisco Bay areas. Melissa Bennett is the Director of Business Continuity and Salesforce.com at Total Safety, the premier global provider of integrated safety services and solutions for hazardous environments. She is responsible for streamlining and re-aligning the processes that touch the Lead to Order sales cycle. Melissa has worked to transform Total Safety's sales processes--focusing on the alignment of sales technology, process, and leadership. Melissa has expertise in process change, forecasting, pricing, proposal management, CPQ, and CRM. She earned an MBA from Rice University as well as degrees in marketing and communications from Boston College. She was the lead transformation agent for the implementation of the CallidusCloud CPQ and Commissions tools at Total Safety. Data, data, data. Companies collect a lot of it, but not all companies know how to use it to improve sales performance. Join Jason Jordan, best-selling author of Cracking the Sales Management Code, as he shares his latest research on the topic of sales forecasting. - This webcast features the simple steps you can take to improve your processes and build superb forecasts and pipelines. Today's consumers come to the negotiating table with more information than ever before. They’ve researched your products online; they’ve read the reviews; they’ve scanned the social channels. For your sales channels to effectively work with these educated buyers, they need onboarding and enablement that goes way beyond basic access to marketing and sales assets. Based on more than a decade of experience deploying sales enablement software, we at CallidusCloud know that you need a dynamic solution that delivers training, content, and coaching in a prescriptive way, if you want to generate consistent revenue growth. •Close deals faster and increase deal sizes and win rates, while reducing time-consuming enablement efforts. •Establish a repeatable onboarding process that reduces new staff time to productivity. •Deliver content in a prescriptive way that advances today's more informed buyers through the sales process. •Improve communication with buyers as well as internally across product management, marketing, sales, and service roles. •Apply a ready-to-use sales enablement maturity model that we’ll provide as a take-away to attendees. The B2C buyer experience has profoundly changed over the past five years. B2B sellers are learning how to translate many of the same lessons and successes to improve the buying experience for their customers and to improve their own profitability. Salesperson activity is an important indicator of organizational productivity and effectiveness, but presents significant data collection challenges. Join us during this first look webinar as we investigate how sales organizations account for salesperson activity, and the nature of the insights they gain through such efforts. Topics addressed include the nature and quality of salesperson activity tracking, the methods utilized to collect information, the types of activities considered most important to track, and the various ways management applies activity data. Investing effectively for the best possible benefits and increasing return on investment creates competition among priorities for investment spend. Research shows that investment in SPM technology improves sales productivity and increases top line revenue, alleviating the competition between priorities. However, 85% of European companies still rely on manual, error-prone processes to manage sales performance. In this webinar we will set out the case for prioritising investment in SPM Technology, identifying the financial and non-financial benefits that SPM technology delivers. B2B companies are looking for ways to provide a great B2C-style buying experience for their customers as a competitive advantage. CPQ provides B2B companies the opportunity to deliver great buying experiences across all channels, without over-rotating toward eCommerce. Join guest speaker, John Bruno, Analyst from Forrester Research and Giles House, EVP of Product & CMO at CallidusCloud, as they explain how sales technologies have transformed and how CPQ positions B2B companies to deliver and support consistently high quality customer experiences. In today's complex B2B sales environment, realizing the full benefits of the sales tool set depends on many factors, namely integration. Over 33% of the organizations studied have minimal to no integration between their sales tools. Through this sales tool integration study, it's been proven that the integration of sales tools with each other and CRM systems result in remarkably better sales outcomes. We want you to be able to generate revenue significantly easier and improve your sales process effectiveness. 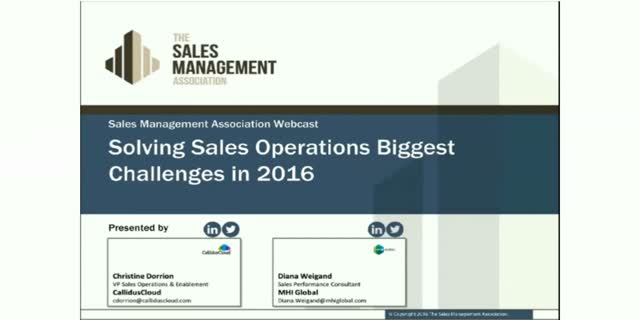 Watch DemandMetric and CallidusCloud to learn why only 15% of the study respondents use 5 or more of the tool categories and what are the top barriers of integrating sales tools. - What is the impact of trapping your sales tools in disconnected silos? - What is the current state of tool integration? - What benefits come when tools are integrated? Sales coaching is widely acknowledged as a high value productivity investment, a view reinforced by Sales Management Association research. Yet few sales forces have impactful coaching programs due in part to the challenges of effectively allocating management’s limited coaching bandwidth. Marketing and sales alignment is a phrase we’ve all heard. But how do we do it? In a survey by Forrester, only 30 percent of respondents said that marketing and sales metrics were closely aligned. Be part of the winning 30 percent and ensure that your sales and marketing teams are using your CRM to its full capacity. Understand how CPQ can provide your CRM with data-rich quote and proposal information to help sales operations educate marketing about their needs throughout the entire lead to money cycle. There is no shortage of data available, but if you don't have an easy way to make sense of it, you'll always come up second best. Dan was joined by two of our customers: Joe Miller, Senior Manager Incentive Compensation at Sunrun, and Martin Andersons, Senior Manager, Sales Strategy and Compensation at AssetMark. Joe and Martin exchanged tips for creating actionable data and using it to make critical decisions to solve their organizations’ biggest challenges. Balancing territories properly is critical for maximizing your sales force's success, and doing so correctly means using data to establish sales territories that will reach their full profit potential. Gartner estimated that, on average, enterprises will miss the equivalent of 10 percent of total sales in lost revenue that could have been captured with improved processes for defining, assigning and managing territories, quotas and compensation plans. Without data, territory mapping and quota calculations become subjective, favor certain sales reps, and often do not maximize the company's overall revenue potential. Join us to learn how you can grow revenue by leveraging the Internet of Things. We’ll walk through the tech stack you’ll need to build your IoT powered business enabling auto ordering, customer specific pricing and ultimately generating more money, faster and increasing profitability. How do you translate good sales process into good customer experience? Sales sets the stage for customer experience during the customer’s buying process. Setting your sales team up for success with the right tools and technology also creates a smoother, more satisfying buying experience and happier customers. Sales reps bogged down by manual processes, product complexity and approval wait times can't respond to customers fast enough and customer experience suffers. - Are your sales reps still using spreadsheets to prepare quotes for customers? - Do your sales reps act as the quarterback between legal and the customer for contract negotiations? - Have you missed contract obligations from not having visibility to contract obligations? These are areas that cause frustration for your sales reps. Join this webinar to hear how Appirio and CallidusCloud help companies improve their sales environment with the right tools. CallidusCloud is the global leader in cloud-based sales, marketing and learning solutions. CallidusCloud enables organizations to accelerate and maximize their lead to money process with a complete suite of solutions that identify the right leads, ensure proper territory and quota distribution, enable sales forces, automate configure price quote, and streamline sales compensation — driving bigger deals, faster. Over 5,000 organizations, across all industries, rely on CallidusCloud to optimize the lead to money process to close more deals for more money in record time.